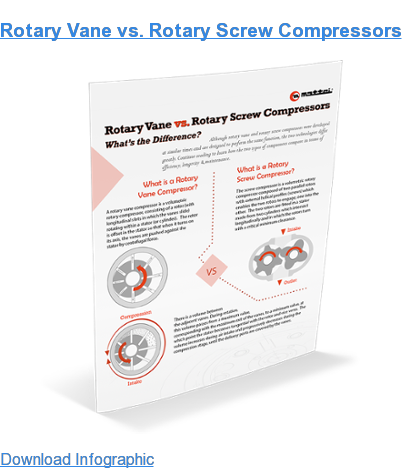 Why choose a Mattei rotary vane compressor? 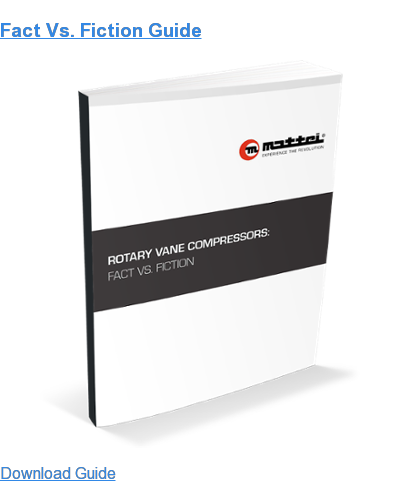 Today, Mattei's rotary vane compressors benefit you from more than 50 years experience in the design and construction of rotary vane compressor technology. 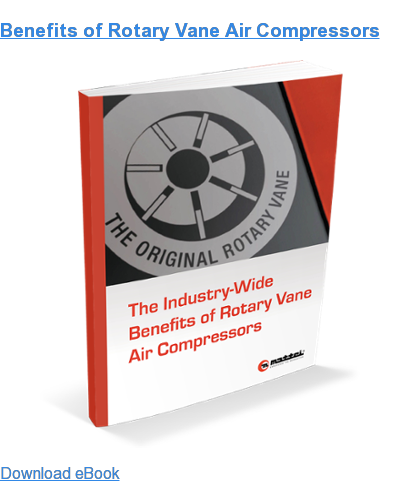 This has resulted in the continuing improvement of both the performance and operation of these exceptionally durable compressors. Mattei continues to leverage advancements in technology and materials to offer the best value in premium quality air compressors found anywhere on the planet. Imagine “bearingless” air ends that last up to 100,000 hours (2 to 3 times the life of rotary screw compressors) without needing an overhaul, unrivaled super quiet operation and the most energy stingy designs in the industry. It’s a fact: Mattei is in a class of its own. Want to get your last air compressor first? Get a Mattei. Mattei compressors distinguish themselves through durability, reliability and efficiency, featuring a modern compact design and exceptionally quiet operation. In Mattei compressors, all main components (oil chamber, separator, air filter, non return and pressure regulating valve) are integral parts of the machine and make up a single unit. The compressor is directly connected to the electric motor to form a single unit that compresses air at only 1,800 rpm or less. The cooling assembly includes both oil cooler and after cooler. These compressors are "ready-for-use" air stations, only needing to be connected to the electrics and air main. Quality is ensured by the use of the best possible materials, irrespective of cost. The rotor is made from spheroidal cast iron, the stator from Meehanite® cast iron and the vanes from special cast iron, to ensure long operating life and stability. The vanes are lightened by deep parallel holes and a curved surface to ease their sliding in the stator slots and are real mechanical "jewels." Benefit from oversized dry air intake filters; the oil separator filter (rated 10,000 hours) features borosilicate fibers; oil and compressed air radiators made from aluminum; the coupling is flexible with rubber elements and all O-rings are made from Viton®. Precision machining is carried out with the most modern and precise production tools (mainly numerically controlled machines), and accurate dimensional checks are made of all components before assembly. Every finished Mattei air compressor is subject to strict international testing standards (ISO 1217) to ensure consistently high product quality and performance.